Results from the 2017 Arvada Citizen Survey are now available. 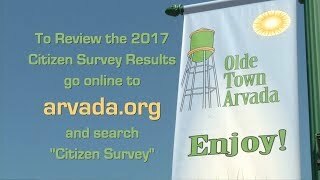 Download the PDF to view how Arvada residents rate the City of Arvada. The Arvada Citizen Survey is conducted every other year, and functions as a consumer report card for the City by providing residents the opportunity to rate their satisfaction with their quality of life, community amenities, and local government. The survey also gives residents an opportunity to provide feedback to the City government on what they believe is working well and what is not, and to communicate their priorities regarding community planning and resource allocation. Download the 2017 Citizen Survey Final Report.